Beacon’s Power Control Module (PCM) is the “brains” of the flywheel storage system and provides the power and signal interfaces for each flywheel storage unit. The PCM allows stored energy to be coupled seamlessly to the grid, enabling instant response and maximum operational flexibility. Beacon can optimize flywheel installations to suit the unique characteristics of each application. Designed in a custom configuration to cost-effectively convert the variable-speed/high-inertia motor/generator output into a clean and stable source of DC or AC electricity, the PCM effectively utilizes the full capability of each flywheel. 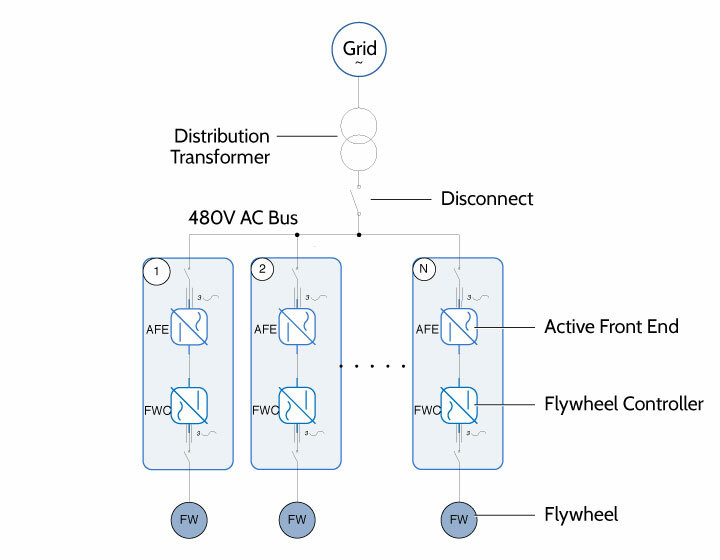 The flywheel has a power output rating up to 160 kW at 480V AC and the ability to provide energy storage for over 30 minutes depending on power injected into the grid. The power and energy transmission can be changed on the fly, injecting or absorbing high power for a few seconds to address immediate frequency response needs or tailored to release energy over a longer period of 30 minutes to match longer duration system variances such as managing wind power generation ramping. For example, at 160 kW of continuous power output, the flywheel would discharge from a full state-of-charge to the low limit of the recommended operating range over 4 minutes. Alternatively, if 50 kW of continuous power were desired, the flywheel could inject that for over 30 minutes. The system is capable of operating based on Automatic Generation Control signals or sensing and responding to the conditions on the grid. In addition to this active power flexibility, full four-quadrant inverters can deliver reactive power continuously. The PCM also controls and monitors the status of critical flywheel operating parameters. 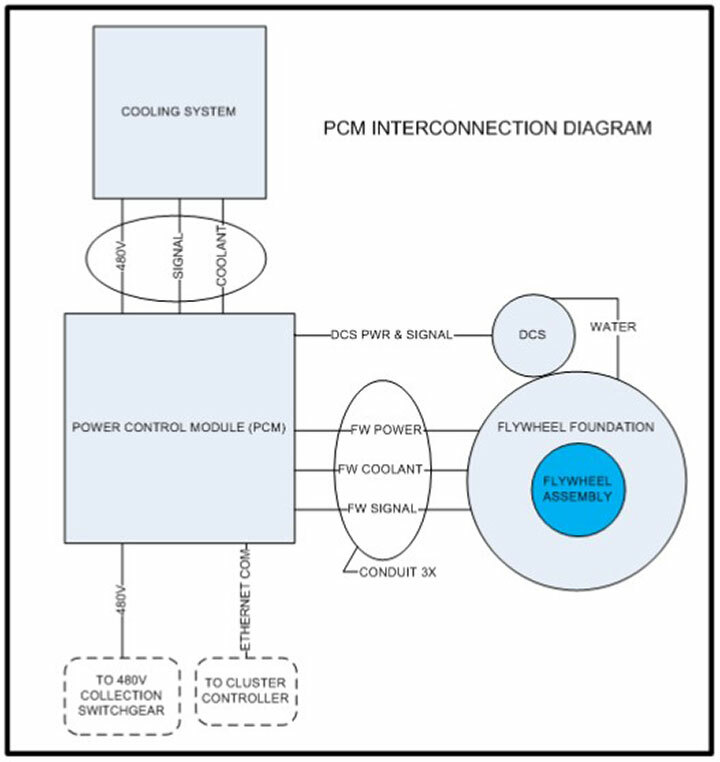 Along with flywheel connectivity, the PCM interfaces with other subsystems that support flywheel operation, such as cooling and vacuum.